Colin was part of a team of 20 international balloon artists brought together for their skill in creating large outdoor balloon décor. The location for this project was in a recently developed upmarket shopping district in Shanghai. Colin’s responsibility in the project was to create a spectacular entrance piece for the VIP cocktail party. 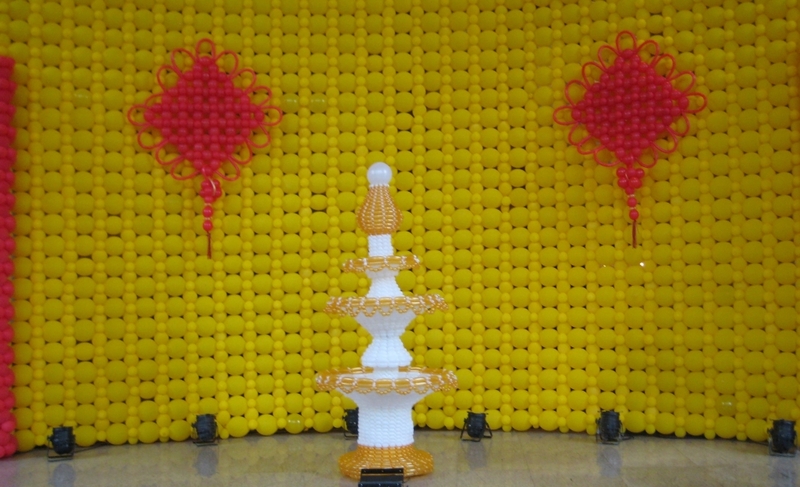 He created a 20ft water fountain, constructed almost entirely of modelling balloons! Also created by Colin was a 40ft tall balloon backdrop for the entrance to the event. The event comprised of a large fashion show, with all the models wearing the latest balloons dresses and hats, created by Colin and the team. The event was opened by the mayor of Shanghai amid a flurry of media interest. The media presence was so large Colin gave a tv interview that was broadcast to 500 million people.